Pra Wat Paknam is also known as Pra Khorng Kuan Roon Neung was chanted in BE2493. A total of 84,000 pieces were chanted. Luang Por Sut of Wat Paknam created this batch of amulets because he wanted to raise fund for the building of a monastry school for novice monks. Luang Por Sut chanted this batch of amulets for 3 months, transfering metta and also a kind of kathah called Wichah Tammagaai, which is very good kathah. He gave the amulet free to people who came to make merit at the temple. Each one was given only one amulet, irregardless of how much the person had donated to the temple, be it just a merely 10 bahts or 1000 bahts, only one piece was given to one person. This batch of amulets, some pieces were coated with laquer and some are not coated, but usually most pieces were not coated with laquer. The colour of the amulets is white colour or ivory colour and some are also yellowish or light brown and even dark brown in colour. The material for this batch of amulets, were not mixed properly at that time, thus most pieces are not in good condition and very fragile and easily broken. Which is why, laquer was used to bond the materials for this batch. There are a total of 10 different moulds (pims) for this batch of amulets. The size of the pims are the same. 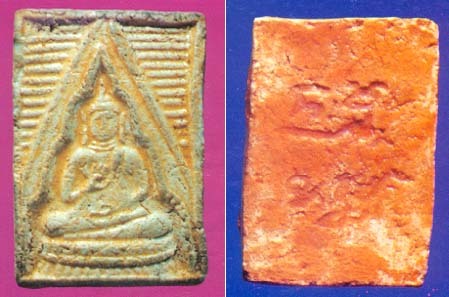 The different in pims are in the face, the hand and the postion of the hand as well as other parts of the buddha image in the centre. The batch of amulets are very proven and the good experiences of people wearing this batch of the amulet are many. Some people are cured of sickness after wearing this amulet, some get energised and have rahsee and metta, and some not injured in accidents. One such unbelievable incident was as such; a child who received the amulet from Luang Por Sut, on the way home, the amulet suddenly floated into the air from her body, that child seeing that, quickly chased after the amulet. The amulet floated into a house, the owner of the house, not knowing what happened, chased the child away and disallowed her to enter. The child cried and tried to explain to the owner that her amulet had floated into his house. The owner refused to believe her and asked her to called her mother. Afterwhich, when the mother arrived, and to find out the truth, the owner let them in. There, they saw the amulet Pra Khorng Kuan Wat Paknam on the altar inside the prayer room. There are too many incidents or experiences encountered by wearers of this amulet. It is not possible to list all these. The effect and experiences would be better explained if one can experience the effect of this amulet himself.